Features a 24" widescreen, flat-panel display. dimensions 13.1" x 22.1" x 2.3"
This monitor features Full HD 1920 x 1080 resolution for unbelievable pixel-by-pixel image performance. You’ll experience the most amazing clarity and detail whether it be while working, gaming, or enjoying the latest in multimedia entertainment. 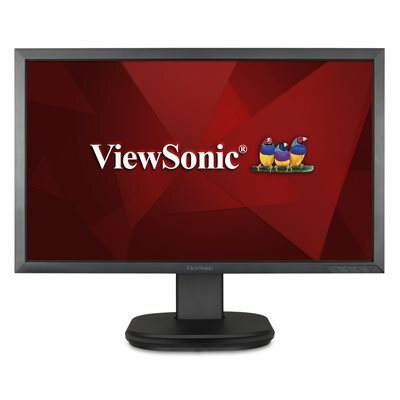 The ViewSonic VG2439Smh is a 24’’ (23.6’’ viewable) Full HD LED multimedia monitor with future-proof connectivity and full ergonomic functionality ideal for corporate, government and education. Integrated with HDMI, DisplayPort, VGA and 2 USB ports, the VG2439Smh allows flexible connection to PC systems, laptops and other multimedia peripheral devices. ViewSonic’s exclusive ViewMode provides intuitive presets to deliver optimized screen performance in different applications. In addition, Flicker-Free and Blue Light Filter technology help to eliminate eye strain from extended viewing periods. The LED backlight design makes this display Energy Star and EPEAT certified.